It’s hard to stand out in a crowded mobile PC market, but Dell’s newest 2-in-1 has one cool feature going for it: wireless charging. The Latitude 7285 features an optional keyboard that enables the wireless power tech. It works pretty much the same as it does on some smartphones: You simply plop the tablet on a special charging pad when you get home and it charges automatically. The advantage compared to smartphones is that the WiTricity technology doesn’t require you to align the laptop any special way on the mat, and you can comfortably use the PC while it’s charging. Granted, that’s not a huge time saver considering you’ll still need a regular charger if you ever need to charge the device on the go. But it’s a pretty neat convenience at home if you have the extra $550 lying around for the mat+keyboard combo. I was able to go hands on with the 7285 very briefly earlier this year. The keyboard and hinge are refreshingly solid; this is one convertible you should have no trouble using on your lap. It’s designed in the vein of the Surface Book, with a screen that can be rotated around for easier tablet use, except there’s no clumsy detaching mechanism – the tablet simply uses very strong magnets to keep the screen in place. Dell also claims the 7285 is the thinnest Windows 2-in-1 to date, which is neat, I guess. 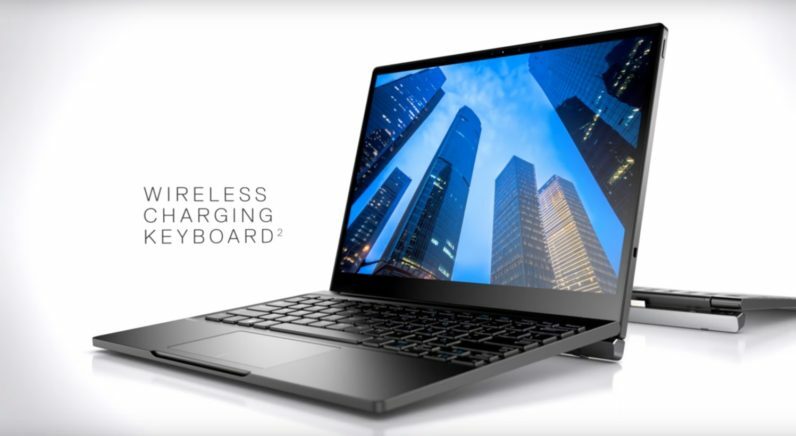 You can go ahead and order one over at Dell’s site now starting at $1,200 – wireless charging keyboard not included.